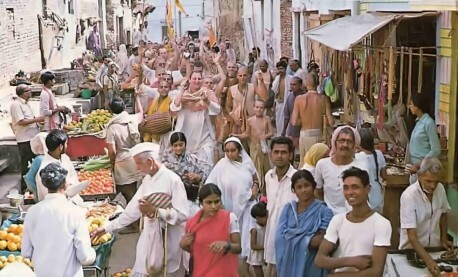 I first learned of Srila Prabhupada’s plan for a “heaven on earth” in Vrndavana, India in May of 1970. Vrndavana is the birthplace of Lord Krishna, which lies some ninety miles southeast of Delhi. 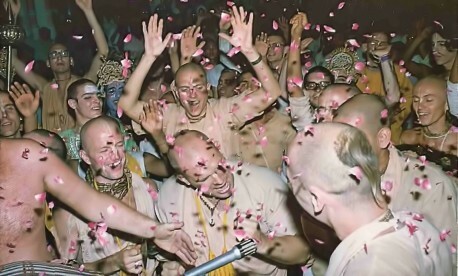 I was in Delhi when Srila Prabhupada wrote me a letter explaining his plan. He asked me to investigate a report that the king of Bharatpur wanted to give us one of his many Vrndavana palaces. Of the many palaces the Maharaja of Bharatpur owned around Vrndavana, the Laksmirani Kunj palace was especially beautiful. In his letter, Srila Prabhupada said it would be excellent as an ISKCON center. So we looked into it. Shower of flower petals rains down as enthusiastic devotees fill the temple with Krishna’s holy names. Beaming devotees chant Hare Krishna as they weave their way through one of Vrindavan’s colorful bazaars. A friend of mine—a water expert—came to help us. We tried to ascertain how we could get sweet water in an area that had up till then yielded only salty. Sweet water was much preferred, for then we would not have to depend on any other source for drinking and cooking water. But a sweet-water well was almost unheard of in that part of the district, because the ground was full of minerals. In fact, our plot was surrounded by tracts with only saltwater wells on them. By Krishna’s grace, however, when we finally dug our well we hit pure, sweet water. Everyone in Vrndavana was amazed. They thought that perhaps we were mystics, and that certainly Krishna was blessing us. In either case, they reasoned, it made our temple very special. The next step in the project was to employ an architect to draw up plans for the building itself. 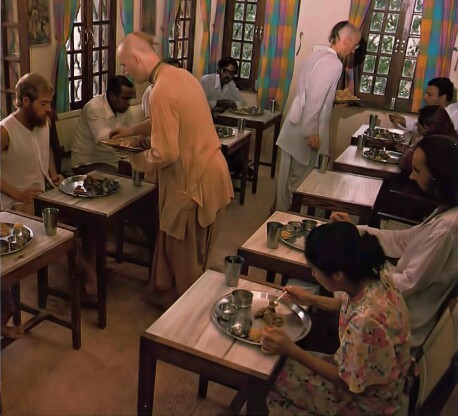 Two architects from India submitted one plan each—very grandiose schemes—and Saurabha dasa, a devotee of Srila Prabhupada’s from Holland, submitted two plans. We chose one of his. He didn’t have as many years of experience as the professional architects, but still his design outclassed theirs. As a devotee, he knew exactly how to arrange things for the pleasure of the Deities on the altar. He designed four Deity workrooms directly underneath the altar—one for sewing, one for storing decorations, one for storing big items such as swings, thrones, and hanging backdrops, and one room with a safe where the Deities’ jewelry could be kept. No ordinary architect could have thought of these things. 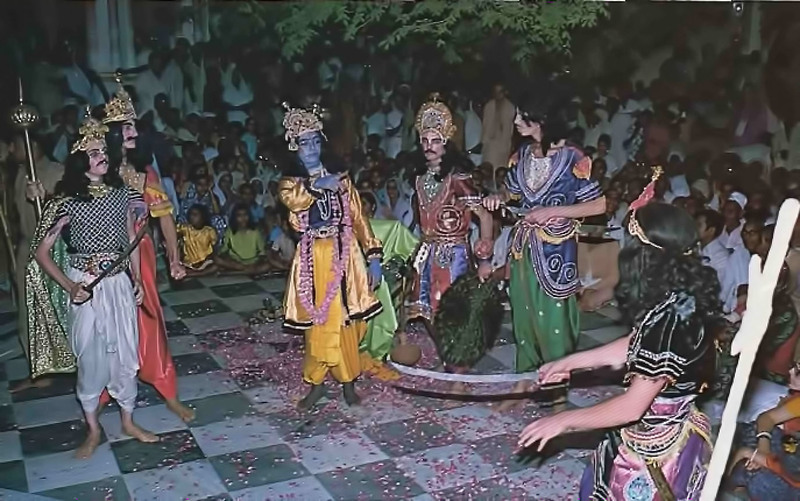 At opening celebration last April, nightly dramatic performances in temple courtyard bring to life India’s vast Vedic literature. That was the first mention of a Krishna-Balarama temple. Srila Prabhupada told us that it would be the only such temple in Vrndavana. He wanted to feature Krishna and Balarama because the area of Raman Reti where the temple was to stand was where Krishna and Balarama played as cowherd boys with Their friends. Raman Reti means “enjoyable sands.” There’s a nice park near the temple dedicated to Their dancing. It has an overwhelming feeling and is a wonderful place to chant Hare Krishna. Meanwhile, several factors were holding up progress. First was a lack of money. The funds for the project were coming from our collections in Delhi, Calcutta, and Hyderabad. Every day two or three devotees would visit businessmen in their offices and appeal to them for donations as part of our membership drive. But the money was coming in slowly. In addition, we had little in the way of building materials because of government shortages. Rather than allot goods to religious groups, they preferred to support the army and movie theaters. Miraculous things would happen. When hundreds of people had been denied their supplies, we’d get our order approved. When there was a flood in the river our sand came from, new sand from another location came through right on time to be mixed with the cement that had just come in from another place. In this way we were being trained to depend on Krishna, especially since we were building His temple in Vrndavana itself. We didn’t consider these obstacles to be unpleasant incidents. They seemed to be Krishna’s test—to see how much love we were willing to put into His temple. Over the next two years, the temple building went up gradually while the guesthouse, which did not require such fine workmanship, shot up suddenly. We planted fruit trees for future gardens and built other shelters for the storage of as many as three thousands bags of cement at one time. Trucks rolled onto the property day and night, and each time a truck arrived, the peacocks would trumpet their joy. It was great. An interesting fact is that the whole temple was built by hand. Our only machine was a little cement mixer. The scaffolding was simply bamboo tied together. The ornamental work—peacocks, elephants, scrolls—was done by skilled masons who chipped bricks by hand. We didn’t buy anything prefabricated. We cut it ourselves out of brick or red sandstone. As the completion date drew near, we traveled all over India getting Deity paraphernalia—marble plates, silver staffs, six-foot brass lamps, clothing, a special type of jewelry from jodhpur, and so on. Then Srila Prabhupada told us how to set up a festival for the temple opening. He told us to invite our life members, religious and government leaders, and dramatic troupes (including ISKCON’s dancers). Now, a year later, the Krishna-Balarama temple is just as Srila Prabhupada wanted it: a living, exciting temple. Classes are held throughout the day in both English and Hindi. Devotees chant before the Deities twenty-four hours a day. The guest house, Vrndavana’s only modern accommodation, has eighty beautiful rooms, each with separate bath and balcony—comfortable living by any standards, East or West—and two first-class restaurants. Today the Krishna-Balarama Temple receives more visitors than any other temple in Vrndavana, proving what Srila Prabhupada has always advised us: with enthusiasm, patience, and complete faith in Krishna, all obstacles can be overcome and all endeavors can meet with success. Delicious vegetarian dishes, prepared according to traditional Vedic recipes and offered first to the Deities, are served at the International Guest House restaurant. Blessed are the people who were involved in the building of the Temple 🙂 The more one reads, the more one understands that NOTHING is beyond KRISHNA. One need look no further. Hare Krishna Hare Krishna, Krishna Krishna Hare Hare, Hare Rama Hare Rama, Rama Rama Hare Hare.